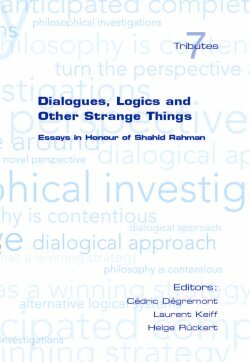 Non-classical views about important issues in logic and its philosophy are a distinctive trait of Shahid Rahman's work. This volume has been designed, on the occasion of his 50th birthday, as a gathering place for unconventional approaches, original ideas and attempts to question well-established standards. Some of the world top philosophers and logicians contributed to a brilliant collection of papers, some of which doubtlessly leave their mark on the work to come in logic and in philosophy of formal sciences. Contributors are: Philippe Balbiani, Diderik Batens, Johan van Benthem, Giacomo Bonanno, Walter A. Carnielli, Newton C. A. Da Costa, Michel Crubellier, Francisco A. Doria, Dov M. Gabbay, Olivier Gasquet, Gerhard Heinzmann, Andreas Herzig, Jaakko Hintikka, Justine Jacot, Reinhard Kahle, Erik C. W. Krabbe, Décio Krause, Franck Lihoreau, Kuno Lorenz, Ilkka Niiniluoto, Graham Priest, Stephen Read, Manuel Rebuschi, Greg Restall, Gabriel Sandu, Gerhard Schurz, François Schwarzentruber, Yaroslav Shramko, Göran Sundholm, John Symons, Christian Thiel, Nicolas Troquard, Tero Tulenheimo, Jean Paul Van Bendegem, Daniel Vanderveken, Yde Venema, Heinrich Wansing, Jan Wolenski and John Woods.